At the end of August (2016), an [article] came out describing an amazing fossil. Why is this fossil so amazing? Because it’s three fossils in one. It was discovered in Germany, in the Middle Messel Formation (around 48 million years ago). This formation is known to have incredible fossil preservation, especially including the stomach contents of its fossils. 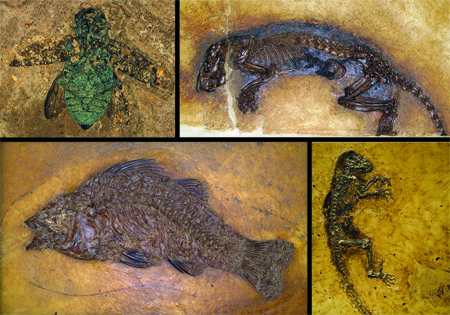 Examples of fossils from the Messel Formation. From Wikipedia. This new fossil is no exception! The fossil is a small snake, around 103 cm (40 inches) in length. 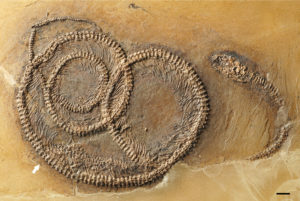 Based on the features of its bones, and knowledge about what snakes were present in the Messel, the authors identified it as a species of boa, Palaeopython fischeri. Additional evidence from the bones and the length indicate that this snake was a juvenile when it died. Figure 1 from the article showing the fossil snake. Inside the snake is a lizard. Inside the lizard is an insect. The snake has its last meal still preserved inside its body. That meal was a lizard, and based on features of its bones, the authors identified it as a basilisk (a member of the iguana family). Only one type of iguana is known from this formation so the authors identify this lizard as Geiseltaliellus maarius. This lizards was older than a juvenile, but not yet fully grown. 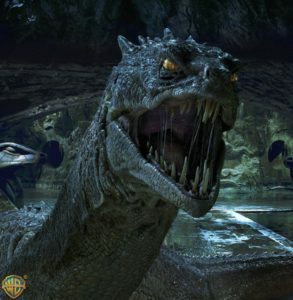 No, not that type of basilisk! ©Warner Bros. 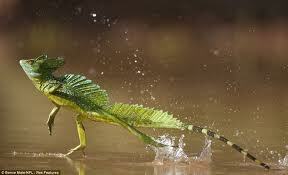 This type of basilisk! From here. The lizard has its own last meal preserved inside its body! In this case it’s an insect, but its poorly preserved so not able to be identified more specifically. Figure 2 from the article showing the location of the lizard and insect inside the snake. The authors used CT scanning to precisely examine the snake and lizard bones. This fossil gives us a lot more information about the diet of these animals. Firstly, other fossils of the same lizard preserve it with plants inside the gut. 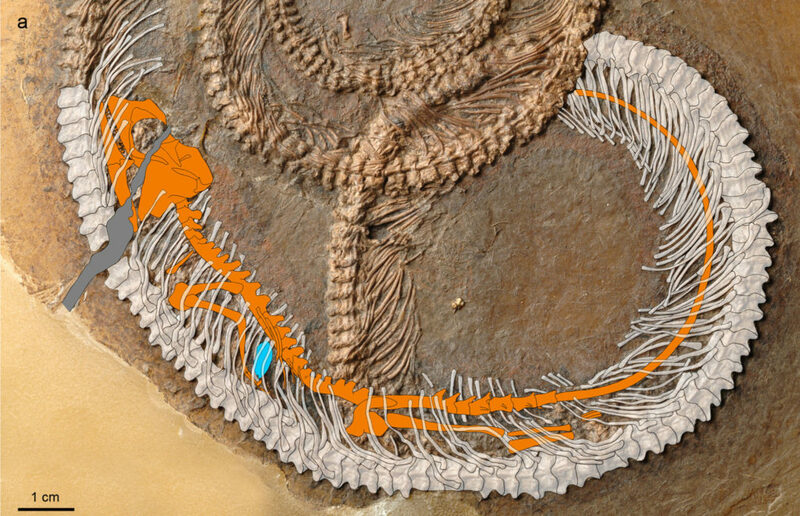 Because this fossil preserves an insect in the gut, we now know the lizard was omnivorous. Similarly, other larger boa specimens from this formation preserve crocodiles inside the snakes. Because this new specimen shows a small lizard, we know that the prey choices of this snake species changed as it got bigger. This is only the second fossil ever found to preserve 3 levels of the food web (called trophic levels) in a single fossil and is truly amazing.